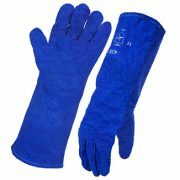 BLUE Welder welding gloves are engineered to provide extra durability and comfort, using the highest quality leather and cotton liners the MOJAVE delivers performance at an affordable price. Cotton sewn and fully lined. 40cm in size. Prices are per pair and suitable for all within the welding industry.